Permanent pacemaker implantation is a lifesaving procedure. Complete heart block is one of the most common indications in our environment. Diagnosis is often missed and treatment is not readily available. These reasons account for the low turnover of cases. Two cases were successfully conducted in our center using the VVIR type of pacemaker, and no significant complications were recorded afterword. All patients presented with typical symptoms of complete heart block and were symptoms free after the procedure. Cardiac pacemaker is a medical electronic device that is implanted into the heart in order to regulate heartbeats (arrhythmia or bradycardia). It consists of two parts, namely, pulse generator (battery and brain box) and the lead electrodes consisting of the wire cables that send electrical signal to the heart from the pulse generator. Pacemakers generally treat two types of arrhythmia, tachyarrhythmia and bradyarrhythmia, but the most common indication for pacemaker implantation is bradyarrhythmia, arising mainly from sinus node diseases and heart blocks. Pacemaker can be classified based on the chamber paced – atrium or ventricle or both (first letter), chamber sensed (second letter), sensing mode – inhibitory or triggered (third letter), and rate responsive or not (fourth letter). Another type of pacemaker is biventricular pacemaker – cardiac synchronization therapy (CRT), usually indicated in severe heart failure where the two ventricles are synchronized, using three electrodes. The first electrode is placed in the right atrium, the second in the right ventricle, and the last into the coronary sinus for the left ventricle. The last two electrodes will synchronize the two ventricles: implantable cardioverter defibrillator is a specialized device implanted into the body-like pacemaker in order to treat ventricular tachyarrhythmias that can lead to sudden cardiac death such as ventricular tachycardia and ventricular fibrillation. Permanent pacemaker implantation is a relatively common procedure in well-established centers. 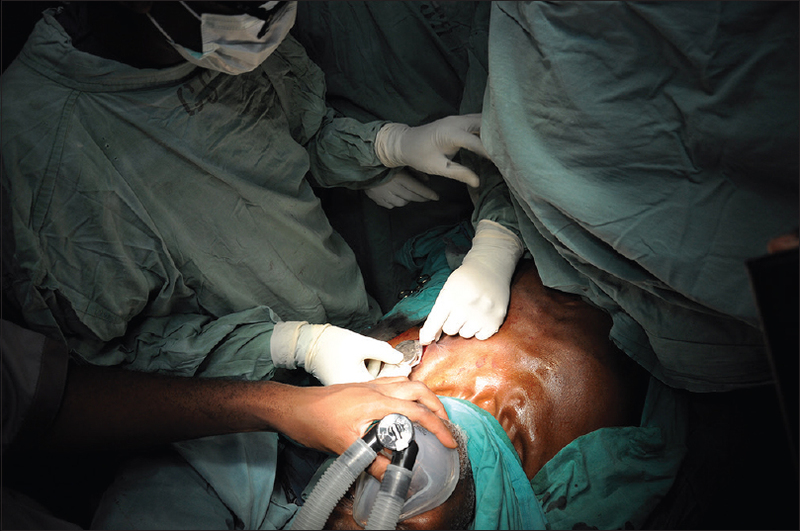 In Africa, however, due to the lack of personnel and proper equipment, the procedure is not so common. Hence, we presented the first two cases in our centers with good outcome. Both patients had VVIR type. Therefore, our discussion will focus on this mode of permanent pacemaker with a single ventricular lead inserted transvenously. A 72-year-old known hypertensive male patient who presented to our hospital with a history of recurrent syncopal attacks with dizziness; he was on oxygen with saturation of about 90% and pulse rate of 30–45/min. The electrocardiogram (ECG) showed complete heart block. 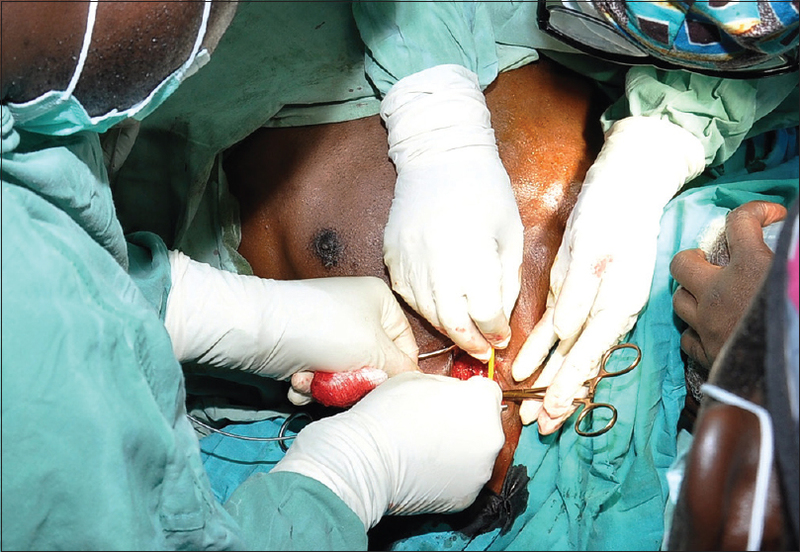 The patient was prepared and offered a permanent pacemaker implantation which he agreed. The procedure was carried out under local anesthesia with sedation. An incision in the deltopectoral groove was made. 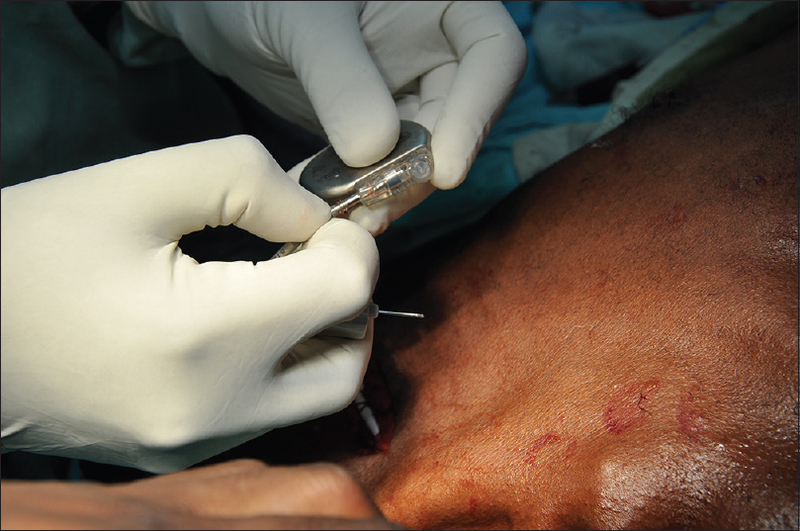 The cephalic vein was identified, but it was so tiny that an introducer had to be used to access the subclavian vein. A prepectoral pocket was made before introduction of the lead electrode wire so as to reduce the risk of lead dislodgment after fixation. The lead was inserted into the heart and was fixed into the right ventricular trabeculae using active lead electrode under the guidance of an image intensifier [Figure 1]. A stylet is usually used and is reshaped to easily allow the tip of the lead to be steered in a specific direction. Lead tip was actively fixed using retractable screw at the tip of the lead which was deployed when the tip was in position. Clip-on tool was used on the distal pin of the lead and was rotated clockwise about 20 times to allow the coil enter into the myocardium. Since modern pacemakers are externally programmable, one can select optimum pacing modes for an individual patient. In this patient, minimum threshold energy was <1 volt (0.8 volts) and impedance 600 ohms. Proximal lead wire was connected to the pulse generator [Figure 2] and buried under the skin [Figure 3]. 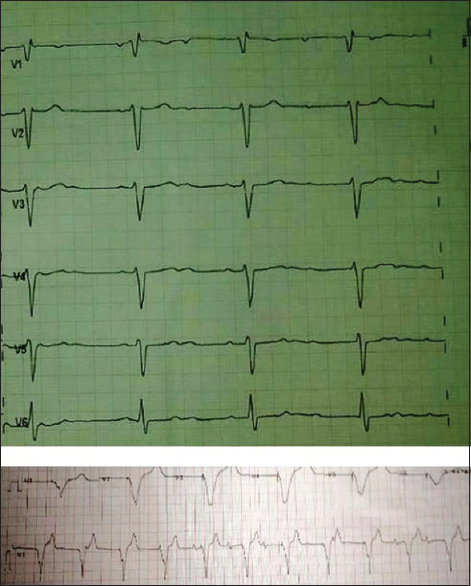 A postprocedure ECG done afterward showed the generation of the pacemaker spikes [Figure 4]. The second case was an 85-year-old known hypertensive male patient who presented to our hospital with a history of recurrent syncopal attacks, easy fatigability, and dizziness. His pulse rate was 35–40/min while the ECG also showed complete heart block. After evaluation, he was offered permanent pacemaker implantation. The lead in his own case was introduced through the cephalic vein [Figure 5] into the right ventricle where it was fixed using an active lead electrode; this technique was similar to that reported by Mac-William. The procedure was done under local anesthesia with sedation. This was similar to that of the first case. His optimum pacing mode threshold voltage was 0.6 volts with impedance of 1.557 ohms. 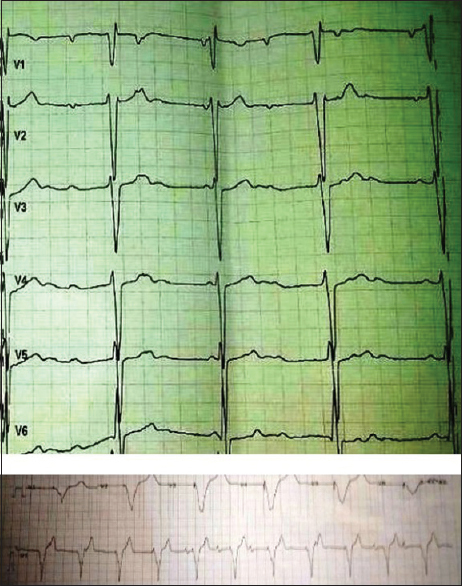 A postprocedure ECG done afterward showed the generation of the pacemaker spikes [Figure 6]. Both patients with complete heart block may present with body weakness, headache, dizziness, and syncopal attacks as was stated in ACC/AHA/NASPE in 2002. However, the diagnoses were confirmed by ECG in both cases. Permanent pacemaker insertion is the only reliable treatment for complete heart block,, and other indications for pacemaker insertion are sick sinus syndrome, symptomatic second-degree heart block, other forms of arrhythmias, and heart failure. In general, after pacemaker insertion, both patients returned to normal life. However, certain activities like contact sports or the use of intense magnetic fields like MRI should be avoided because they can interfere with pacemaker activities. Periodic pacemaker check is also required to check the battery (pulse generator) life span as it runs down over time and needs to be replaced (8–10-year interval). Sensing, impedance, and threshold are also checked during follow-up to ensure the integrity of the pacemaker. Complication can occur during insertion or afterward such as bleeding, hematoma at the pocket, and infection at the site which may necessitate change in the site of insertion.,, During surgery, hemothorax, pneumothorax, air embolism, and cardiac rupture may occur. 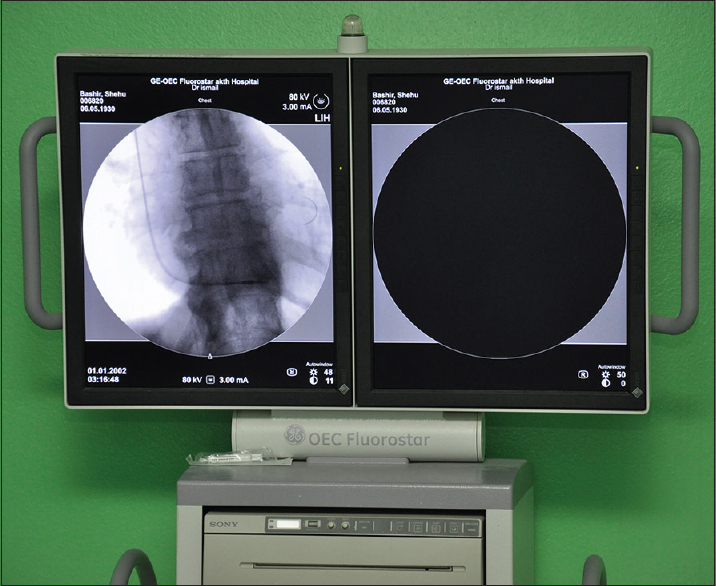 Other complications include battery migration into the axilla, lead fracture or dislodgment. Pacemaker syndrome is a retrograde ventriculoatrial conduction which will lead to hypotension, fatigue, and dizziness and is usually treated by replacing single-chamber pacing with double-chamber pacing. Failures to capture, failure to output, oversensing, and undersensing are all complications related to the pacemaker. Twiddler's syndrome is a permanent malfunction of a pacemaker due to patient's manipulation of the pulse generator in a capacious pocket. The lead is dislodged, and ventricular pacing ceases. Subsequently, with continual reeling of the leads around the generator, the ipsilateral phrenic nerve is stimulated, resulting in diaphragmatic pacing and the sensation of abdominal pulsations. However, in our patients, none of these were encountered. The rate of complication of pacemaker insertion is 4%–5%, the incidence of late complications of permanent pacemakers has been reported as 2.7% by Chow et al., but we are yet to experience any in the index cases so far. Permanent pacemaker implantation is lifesaving procedure and its indication is usually complete heart block mostly affecting elderly hypertensive patient as seen in our patients. Early recognition and permanent pacemaker implantation is, therefore, lifesaving. The authors certify that they have obtained all appropriate patient consent forms. Ethical approval was obtained on 25th August 2016. Furthermore, the patients have given their consent for images and other clinical information to be reported in the journal.. The patients understand that their names and initials will not be published and due efforts will be made to conceal their identity, but anonymity cannot be guaranteed. Medtronic Minimally Invasive Pacemaker the Size of a Multivitamin – Singularity HUB. Available from: http://www.llsingularityhub.com. [Last assessed on 2013 Des 29]. Chow AW, Lane RE, Cowie MR. New pacing technologies for heart failure. BMJ 2003;326:1073-7. ACC/AHA/NASPE Guideline Update for Implantation of Cardiac Pacemakers and Anti-Arrhythmia Device; 2002. Furman S. Pacemaker syndrome. Pacing Clin Electrophysiol 1994;17;1-5. Furman S, Schwedel JB. An intracardiac pacemaker for stokes-adams seizures. N Engl J Med 1959;261:943-8. British Cardiovascular Society. Available from: http://www.bcs.com. [last assessed on 2013 Des 29]. Pacemaker Risk –Mayo Clinic. Available from: http://www.mayoclinic.org. [Last assessed on 2016 Jan 01]. Yamaguchi T, Miyamoto T, Yamauchi Y, Obayashi T. A case report of successful permanent pacemaker implantation via the iliac vein. J Arrhythm 2016;32:151-3. Beckerman J. Heart Diseases and Pacemakers. WebMD Medical Reviewed. Available from: http://www.webmd.com. [Last assessed on 2016 Sep 9]. Nicholson WJ, Tuohy KA, Tilkemeier P. Twiddler's syndrome. N Engl J Med 2003;348:1726-7.